Dakota’s story is one of my favorite ones. 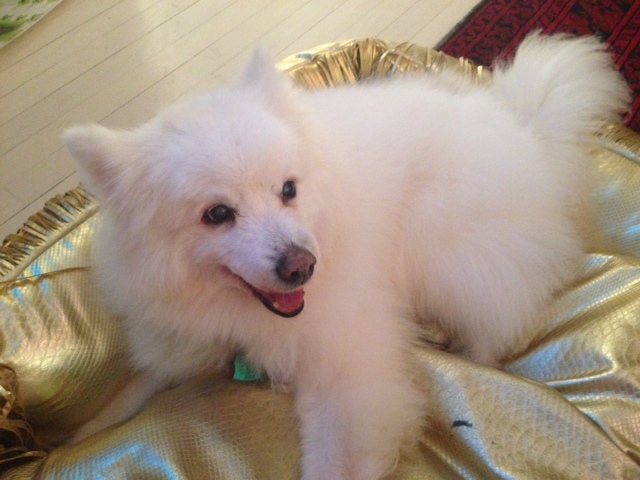 This beautiful American Eskimo reminds me in some ways of my grandmother, who at 101, is still going strong. Today, I want to share Dakota’s secret with you. For a 16 year old pet his size, Dakota has a very good quality of life. I’m mostly impressed at what little he’s changed over the last 3 years and how he continues to be very strong while exercising. We know that these outliers tend to have a combination of a good genetic foundation and an environment that minimizes the effect of time in the tissues. Since up to this point there’s little evidence on how much we can control the effect of genes, I am going to focus on the importance of some of the environmental factors. His owner Adina Newman has been very diligent over the years in taking care of him, keeping up with regular vet check ups and making the extra effort to maintain good dental health. Over the years, Dakota has developed some of the typical problems associated with senility, including poor sleeping patterns during the night time and moments of arthritic discomfort . However, even though he sleeps during a big chunk of the day, Dakota is still very strong and active. I feel that an important component to his quality of life is that Dakota has adhered to a routine that keeps him engaged with other pets and people on a regular basis, going to daycare often and having a weekly exercise routine at Water4dogs. He loves his 45 minutes sessions with the team in the pool and treadmill. I have no doubts that maintaining his muscular strength and conditioning has played a big Dakota, additionally, receives a combination of injectable glucosamine, fatty acids, milk thistle and other supplements designed to help with the oxidative changes that go on in his body and brain. If Dakota gets any flareups of arthritic pain, we may use acupuncture or laser therapy to alleviate the tissue inflammation and pain. These alternatives allow us to rely minimally in any other anti-inflammatory (pain) medicine. Dakota exemplifies the integrative methods that we utilize in maintaining quality of life in the senior pet population. The rest is up to him and his owner, who have both put the best efforts during this process and we commend them for this. Click on the video to enjoy Dakota during one of his work outs. Way to go Dakota, keep strong!